To kick off the 2010 American Cheese Society conference, there were three tours originating from points a few hours away from Seattle and visiting various creameries and retail stores along the way. After the Portland Wedge Cheese Festival last year, I got roped into volunteered to help lead the Portland to Seattle tour which left the morning before the festival, arriving in time for the opening keynote address that evening. Our itinerary had us starting early in the morning in downtown Portland, visiting the Hollywood Whole Foods for snacks and then heading up to three Washington state creameries on the way to Seattle. We picked up cheese along the way and on the last leg, had a cheese tasting with wine and beer on the bus! My partner in crime, Bill Stephenson from DPI Northwest, was very adept at cutting the cheese at the front of the bus as I wandered the aisles with wine and some of the finest Oregon craft beer (graciously donated by the Oregon Brewer’s Guild). We all had a lot of fun and only lost a little cheese when the bus braked hard and Bill’s cutting board went flying. For my part, I only spilled a little wine and beer on one poor guy who was very good-natured (and luckily wearing navy blue pants!). 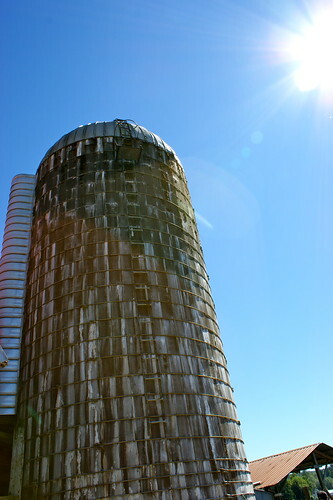 Here’s just a little wrap-up about the creameries we visited. 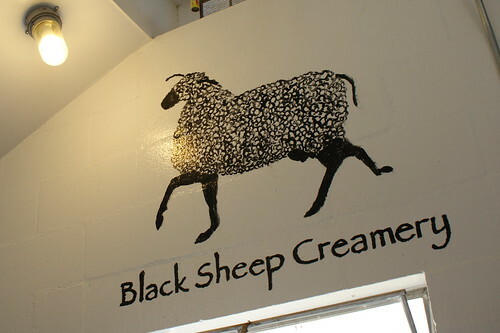 We started out at Black Sheep Creamery in southern Washington. Black Sheep makes only sheeps milk cheese and raises their own sheep and tends their fields for hay. In 2007, their farm and dairy was devatasted by the rising waters of the nearby Chehalis River. To walk by this river today, you’d marvel at how such a gentle meandering stream of water, looking barely larger than a creek at summer’s end, could cause so much devastation. But when heavy and sustained rains came in the fall of 2007, it brought with it tons of silt from the nearby clearcut hills. Black Sheep bore the brunt of this destruction. The flood covered their fields in a thick layer of silt, and took the lives of many in its herd. It lifted their aging room – a repurposed shipping container – and carried it about fifty yards where it caught on some high ground. It’s a real blessing that they have managed to get back on their feet, as Black Sheep makes exceptional sheeps milk cheeses. We sampled their Queso de Oveja which is like a livelier, younger Spanish manchego – you can practically taste the sheep leaping in the meadow! It’s a really lovely cheese which took home a deserved blue ribbon in the ACS competition category for aged sheep’s milk cheese. If you’re in the Northwest, you should look for it today! 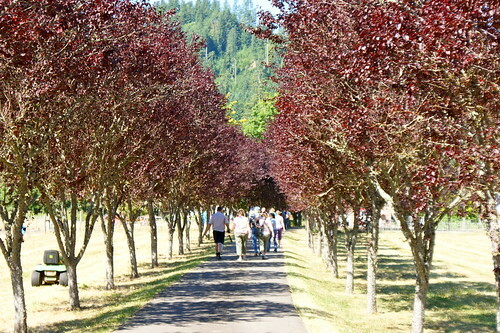 Just up the road from Black Sheep is Willapa Hills Creamery. 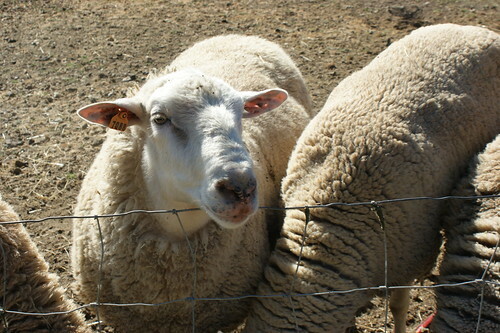 Also raising sheep, they do both sheeps milk and blended cheeses. They are are focusing on blue and soft-ripened cheeses and are getting a lot of acclaim this year for their Two-faced Blue, a truly buttery blue made from sheep and cow (the two faces) it is decadent like a triple-cream with lovely blue notes that do not overwhelm. Their Little Boy Blue is firmer and more robust in flavor with lots of mold. It’s bold without knocking you over. Amy and Stephen showed us around the operation and let us look into their caves. They have three young kids whose faces show up on their cheese labels and we were lucky enough to come by while KelseaMae was in the process of making cheese. Willapa Hills were also winners in the competition for their Two-Faced Blue which took 2nd place in the Blue-veined Sheep or Mixed Milk Category. I’ll be trying to bring this cheese to any and all parties I’m invited to – it’s really unique and fantastic. Our final stop was Kelli Estrella’s creamery which she runs with her whole family. All the kids help out with the extensive farm duties with her oldest daughter taking on the role of cheesemaker. Kelli has made a name for herself for her superb aged cheeses. 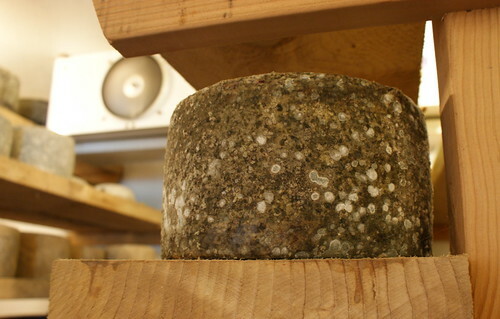 When you go to Europe, you see cheeses that are kind of like this – mottled, strange, pungent. Creating an exceptional aged cheese requires patience, diligence, a commitment to the science of it and wild leaps of faith. Estrella is a cow farm and they make a staggering array of cheeses. Their most beloved and well-known is probably the Red Darla, a double-fist-sized lump of cheese with a sticky, newspaper-grey rind derived from the red wine wash that is applied to the cheese. It isn’t the prettiest cheese but, wow, is it good! Pungent, creamy, assertive but not rude, it’s a fantastic cheese and a great pair for beer. Yum, yum, yum! They took a blue ribbon for their Weebles, in the Smoked Italian Styles category and a 2nd place win for their Jalepeno Buttery in the Flavored Cheeses. A huge thank you goes out to the creameries for opening their doors and their caves to our group who had a really great time. It was so informative and amazing to meet the makers, hear the stories and really connect with all the hard work and love that goes into these exceptional products. Don’t miss: Lots more photos of the cheese caves and cheese makers on my Flickr pages! You didn’t think I could get through this without talking about beer, did you? You are right. At the last minute we managed to secure some donations of Oregon microbrews from the Oregon Brewer’s Guild to take on the bus and sample. We already had some donated bottles of red and white wine but, you know, these people on the tour came from all over the U.S. (and New Zealand!) and I felt that it was my duty to expose them to Oregon beer. There’s just nothing like it anywhere else. The Donations included several bottles of Rogue Brewing beer, Deschutes Brewing Green Lakes Organic, HUB’s brand new Rise-up Red, several bottles from Oakshire down in Eugene (Overcast Espresso Stout, Line Dry Rye, Watershed IPA). Oakshire is really knocking it out of the park these days. I was really surprised by the Watershed IPA. It’s a nicely-hopped beer without being too bitter. Incredibly drinkable and great for summer. It’s really nice to see brewers tempering their hop usage and creating notes of hops and not relying on it as the entire character of the beer. Well done, Oakshire! We liked it with the Two-Faced Blue from Willapa. I was impressed with how interested everyone was in the beer – including people that said they were wine drinkers only. They came around and sampled quite a few brews. We opened a lot of bottles and kept passing beer then cheese then wine then cheese then more beer then cheese then… any more beer? Yes, please! I was dubious about the plan to do a tasting on the bus, rambling along at 60 miles an hour, but it worked out and nobody got hurt! Next: Part II, the ACS conference and festival of cheese!